Helping to revive original Shaker music that was lost for 150 years. Authors debut hidden Shaker music. Kentucky authors Rebecca Mitchell Turney and Marie Mitchell will perform four newly discovered Shaker hymns on Saturday, July 16, at Pleasant Hill Shaker Village, southeast of Lexington, Kentucky. It will be part of a special Shaker Music Day celebration. "These are authentic songs written by Pleasant Hill Shakers around the time of the Civil War," Turney said. "It is quite possible they haven’t been heard for 150 years.". Turney (Park Hills, Ky) and Mitchell (Richmond, Ky) partnered with Shaker scholar Dr. Carol Medlicott from the History and Geography Department of Northern Kentucky University in searching out the religious music written at Shaker Village of Pleasant Hill during its peak of success—the 1830-1840s. Medlicott, who hopes to join the authors to sing these songs during the Music Day festivities, combed through period diaries and archived hymnals of the 1800s to locate the long-buried musical material. She then transcribed the songs from the unique Shaker hand to modern musical notation. 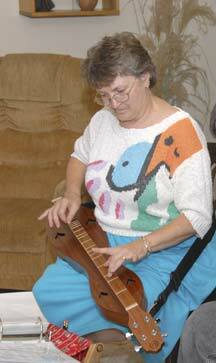 From there, Turney adapted the music so it could be played on Kentucky’s official musical instrument, the Appalachian lap dulcimer. "In the early nineteenth century the Shakers didn’t approve of musical instruments other than the voice, which they regarded as a gift from God," Turney said. 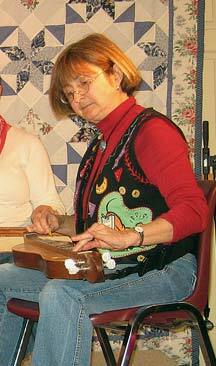 "But Marie and I thought the simple songs were well suited to the soft sound of the dulcimer. We are now eager to play them in the beautiful, pastoral setting where they were written." "The Shakers were hard-working people dedicated to creating a heaven on earth," Mitchell said. "At the end of each laborious day they still found the energy for singing and dancing that literally rocked the Meeting Hall where they worshipped." 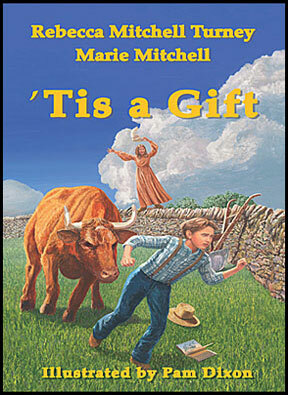 Shaker music plays a central role in Turney and Mitchell’s most recent historical fiction children’s novel, `Tis a Gift. On July 16, the writers, along with their illustrator Pam Dixon, will be available to autograph copies of `Tis a Gift during the Shaker Music Day event. "Although it’s set in 1837, the book connects with modern readers because our main character, 11-year-old Tad, faces the timeless issue of bullying by the older and bigger boys," Mitchell said. "There’s also some bull-headedness on Tad’s part as he struggles to find where he fits in at Shaker Village. It turns out his gift is composing music and choreographing their all important religious dancing." `Tis a Gift is the second in a three-part Pleasant Hill series published by Louisville-based MotesBooks. Road To Pleasant Hill (2010) introduced Tad’s older sister, Betsy, who had her own problems adjusting to the quirky Shaker lifestyle. That book, which focused on the Shaker herbal industry, was a Kentucky Bluegrass Award nominee for the 2010-2011 school year. The third and last book in the series, Tree of Life, is expected to be out in December. It features an artistic girl, Grace, and the Shaker textile industry which included weaving and the raising of silkworms. Return to the Kentucky Girls Books home page.